Andrés Vargas Gómez, Cuban diplomat, lawyer and former political prisoner, was born in Havana, Cuba on May 4, 1915. He graduated from the School of Law at the University of Havana in 1944 with pre-law courses at Tulane University, New Orleans, Louisiana. He married María Teresa Campa in 1960. From 1936 to 1959 Vargas, Gómez was director of the "División Asuntos Ecónomicos del Ministerio de Estado,” member of the “Comision Técnica de la Junta Nacional de Economía,” member of the “Comisión Técnica Arancelaria,” and member of the "Colegio de Economistas de Cuba." As a diplomat, he represented Cuba in various international conferences given by the United Nations, the World Organization of Sugar, and was chief of the Cuban Delegation to The General Agreement on Tariff and Trade (GATT) conference. In 1960 he was assigned as Ambassador of Cuba before the European Organization of the United Nations in Geneva. He resigned this position on the same year when he attained knowledge that the new government of Fidel Castro conspired to establish a Communist regime in Cuba. Vargas Gómez came to the United States on that year and was one of the founders of “Frente Revolucionario Democrático.” This was the first organization that confronted Fidel Castro and that constituted the civil branch of the process of Bay of Pigs Invasion. He was also a member of the “Comité Ejecutivo del Frente Revolucionario Democrático” and director of its radio broadcasting station “Por Cuba y Para Cuba.” Vargas Gómez assumed the political responsibility of the invasion of Playa Girón (Bay of Pigs Invasion) and returned to Cuba as a member of the underground resistance. As the Bay of Pigs Invasion failed, he was taken prisoner and sentenced to death. Later Vargas Gómez was re-sentenced to thirty years in prison of which he served twenty one years. He came to Miami, Florida in June, 1984, and currently lives in Coral Gables, Florida with his wife María Teresa. Vargas Gómez published several books, among them Poemas Innominados, Sombras y Luces, and Espejismos y Agonías. Also, he has been a columnist in local newspapers such as El Diario las Américas, The Miami Herald, and El Nuevo Herald. From August 1984 to 1985 Vargas Gómez was Project Director of the Latin American Institute at St. Thomas University, Miami, Florida. Currently, he worked as a consultant of the International Trade Board of the city of Miami. Andrés Vargas Gómez is a prominent member of the Cuban exile community, working for human rights and the release of political prisoners in Cuba. He is the grandson of Generalísimo Máximo Gómez who played a very important role in Cuba's Independence. The Andrés Vargas Gómez Papers are comprised of material provided by A. Vargas Gómez which includes manuscripts, correspondence, transcripts of conferences and radio commentaries, photographs, and publications. This collection also contains material on human rights, various associations and institutions, and on Generalísimo Máximo Gómez. These papers were given to the Otto G. Richter Library in 1989 by Vargas Gómez. The Library will continue to receive material from Mr. Vargas Gómez. 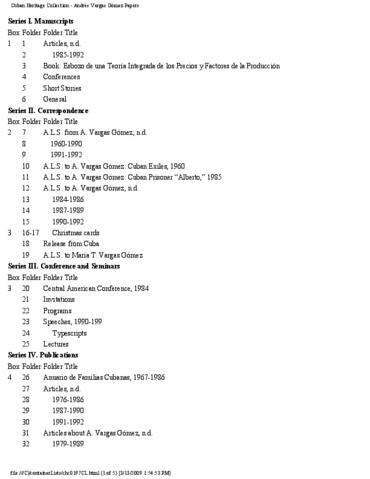 The Andrés Vargas Gómez Papers are organized into ten series. Please see the Finding Aid/Inventory section of this guide for more detailed information. Gift of Andrés Vargas Gómez, 1989.